A budding New Orleans tradition, the second annual San Fermin in Nueva Orleans (SFNO) took place last Saturday. 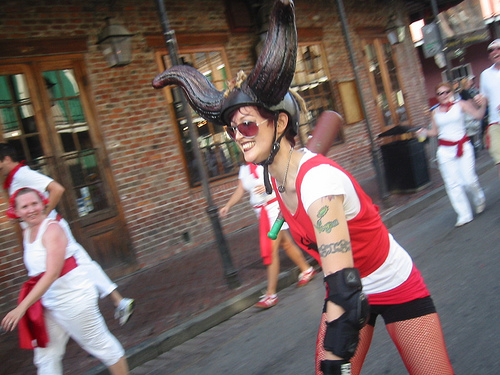 Inspired by the famous running of the bulls in Pamplona, Spain, the Big Easy version takes place in the streets of the French Quarter, and replaces the bulls with a potentially even more dangerous threat: the thirty-odd members of the Big Easy Roller Girls, NOLA’s local all-female roller derby team. Runners dress themselves in the same white clothing and red sashes traditionally worn by the San Fermín corredors. 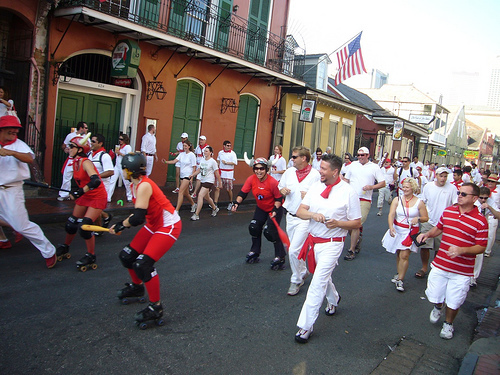 After a prayer to Saint Fermín for protection, the runners are then chased en masse down Bourbon Street by the wiffle-bat wielding, bull-horned Roller Girls. It is a timeless test of bravery and stupidity, and just like San Fermín, few runners escape uninjured. Or at least unwiffled. This year’s run even featured a “toro mecánico” (a converted grocery cart) and an appearance by the Rolling Elvi, a troupe of scooter-riding Elvis impersonators.